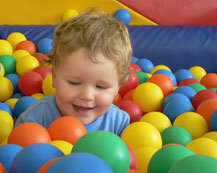 The “Place to Play” for any parent or carer with a child under five. Open 5 days a week Mon - Fri, we offer activities to suit babies, toddlers and pre-schoolers, in a great friendly atmosphere. Our three big bright play rooms open from 10am – 3.30pm mean you can drop in and play at a time that fits in with your child’s routine. We are parent run and funded through membership fees and fundraising.Parents and carers from any area of Glasgow are welcome. We are like a toddler group: you stay and play with your child at the Playrooms.The range of activities on offer ensures that every child will find something they enjoy. Children can experience a nursery type setting with mum, dad, gran etc always on hand. Oh! And we are open during school holidays! Once you’ve been, you’ll wonder what you ever did without us!